Star Wars had one of the most profound cultural impacts of any movie franchise. Even if you haven't seen the movies (and there's only a few of you out there), you know that Darth Vader reveals himself to be Luke Skywalker's father, much to his dismay. In honor of Father's Day, we compiled a list of 4 Darth Vader facts that you probably don't know. Get to know some of the finer points about this bad dad and use the promo code VADERFS to get free shipping on any Star Wars shirt for a limited time! "The Imperial March," Darth Vader's ominous theme song, isn't heard until Star Wars Episode V: The Empire Strikes Back. Even the prequel trilogy contains the Imperial March during several scenes, making the first film, A New Hope, the only Star Wars movie that doesn't have the music. 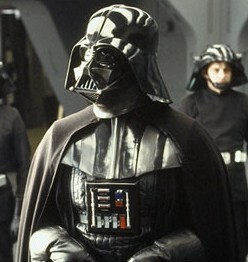 James Earl Jones lent his voice to Darth Vader (who was played on screen by David Prowse), but he felt that he didn't contribute enough to the role to warrant a credit. Jones said, "Not only did I refuse credit, I told everyone it wasn't me." He wouldn't allow his name to be added to the credits until the third original movie, Return of the Jedi. There is also speculation that Jones was convinced that the movie would flop and didn't want his name associated with Vader. James Earl Jones and David Prowse make two, but there are still five others that have played Darth Vader throughout the Star Wars franchise. In the original series, professional fencer Bob Anderson did many of Vader's lightsaber duels, and in Return of the Jedi, Sebastian Shaw stood in for several scenes in place of Prowse. The films were later re-released with updated visual effects and scenes, which were played by C. Andre Nelson standing in. Finally, in the prequel movies, Anakin Skywalker (who later goes on to become Darth Vader) was played by Jake Lloyd and Hayden Christiansen. 1. Vader never actually says, "Luke, I am your father"
If you're a movie buff or a Star Wars geek, you've probably used the line "Luke, I am your father" on any number of occasions. While that line is pretty close to what Darth Vader says in his great reveal, it's not an exact quote. The correct line is actually, "No, I am your father," which isn't quite as quotable. Old School Tees carries a variety of Star Wars shirts, including Darth Vader t-shirts, Chewbacca shirts, and many other Star Wars themed shirts in vintage styles. Use the coupon code VADERFS to get free shipping on your order for a limited time. I can't believe that James Earl Jones did not want the credit for his work. It's kind of Ironic that he had no idea how far Star Wars would go, that is his second most famous role in my opinion. My favorite was in Coming to America and Lion King trails right behind. He makes a great king or authority figure. Thanks for the interesting facts! I had never noticed they didn't play the Imperial March in the 1st film! Now you mention it though, I can't ever remember hearing it, I'll just have to watch it again - any excuse to watch the films again. A little fact of my own: David Prowse was also a British Weightlifting Champion, and although he was not generally involved in the stunts, he actually performed the scene where Darth Vader throws the Emperor into the shaft after a week of watching his weedy stunt double struggle. Anyone else have any cool Vader facts? One of movies most mis-quoted movies, I had no idea! I hear that quote all the time in other movies and by friends and never realized it was not 100% correct! I was a little girl when the original movies came out and I loved them! I had a star wars lunch box too bad I didn't keep it because it would be worth money today if in good shape, ha! Vader is one of my son's favorite movie characters, he has a mask that makes the heavy breathing noise even! Haha, before i forget, i have to say that i loooove the Star Wars Abbey Road Shirt, that is sooo flippin cool ! The cross breed of The Beatles and Star Wars is genius ! Who thinks that stuff up, hahaha ! When i see the words " 4 Facts About Darth Vader You Probably Didn’t Know " I am Totally in ! and as i read it, i had an epiphany, your right ! I did not know that the " imperial March was not played in the original film ! never realized it, then i moved down the list and one by one, i had to admit, i did NOT know that .... or that ... or that, dang ! and as i landed on number 1 on your list, i realized, i was among the many millions who think Darth Vader said " Luke, i am your father ! WROOOONG, HAHA, The correct line is actually, "No, I am your father," which, as you mentioned above, " isn't quite as quotable " .... great post ! keep up the cool work ! Jmaes Earl Jones has one of the most distinctive and recognizable voices of any actor. I loved him in Field of Dreams too!